Built in graphs with data retention of 10 years! No Need for an external monitoring server. The graphs below are created by the RMS-300 board using RRD tool. Graphs are available for each voltmeter , temperature, and system load. Day, Week, Month, Year, 5 Year and 10 Year graphs are available. Below is a screen shot of a graph made with PRTG. 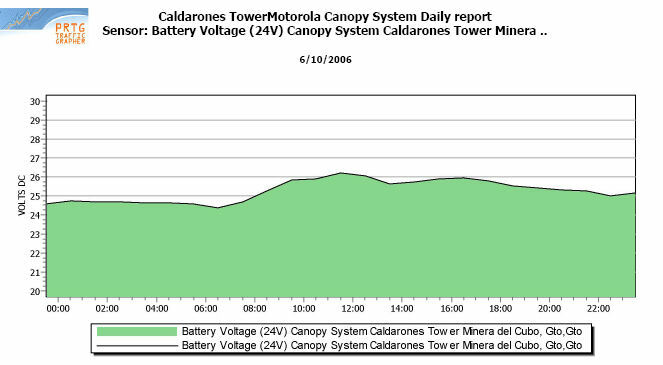 The voltmeter graph depicts battery voltage at a mining site in Mexico. Below is another screen shot of a graph made with PRTG. The voltmeter graph depicts an 18 volt power supply. Below are screen shots of graphs made with CACTI. The graphs depict temperature and battery voltage.